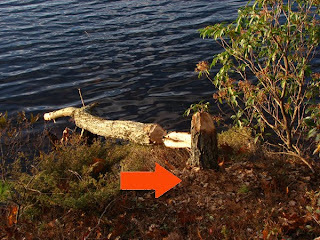 This is not Our Dam Beaver. 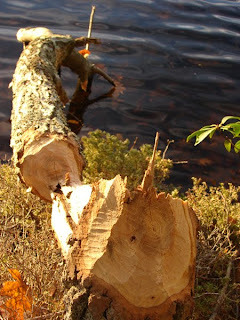 A couple days ago, Raj and I took a late afternoon walk out to Beaver Spit in pursuit of the Elusive Dam Beaver. So far, only Michele and Raj have actually seen that Dam Beaver, and though it is tempting for me to put the sighting down as a figment of their collective imagination, the Dam itself and some newly surfaced evidence point irrefutably at the fact that we do indeed have at least one Dam Beaver in our neighborhood. No need to chew one's way all the way through! Sawdust. Or, is it tooth dust? 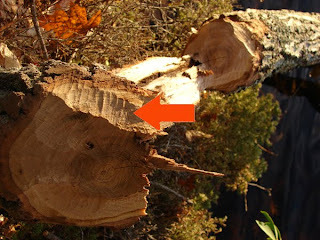 Here's a random Beaver fact that may explain why The Dam Beaver is so Elusive! 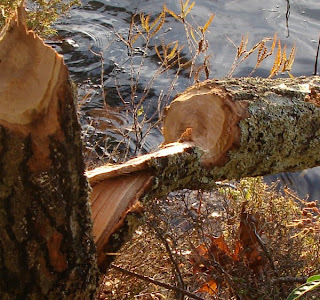 "The 17th century Catholic Church actually declared beavers to be a fish according to dietary restrictions, meaning they are OK to eat on both Fridays and throughout Lent. 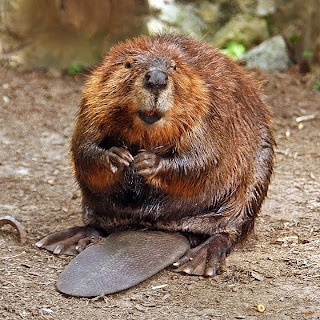 Beaver meat was a common dish by Native Americans and French settlers to America, so the decision was believed to be important to these people’s behaviors..." From Neatorama's Interesting Facts About Beavers. And finally on the topic of Beavers, lest you are unaware of the origin of the phrase "Dam Beaver," by all means, do read the correspondence between the State of Michigan and Steve Tvedten for an explanation.